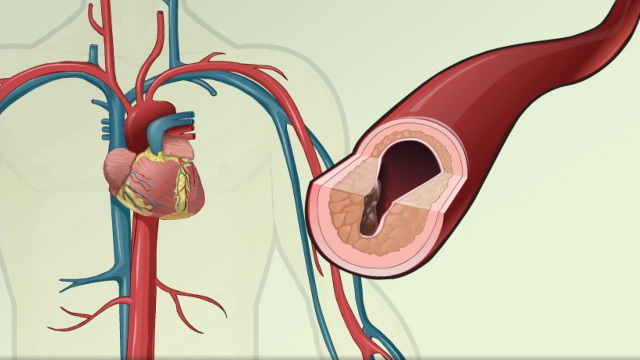 Coronary heart disease (CHD) is a narrowing of the small blood vessels that supply blood and oxygen to the heart. Angina is chest pain or discomfort that most often occurs when you do certain activities or feel stressed. This article discusses what you can do to manage chest pain and reduce your risks from heart disease. CHD is a narrowing of the small blood vessels that supply blood and oxygen to the heart. Angina is chest pain or discomfort that most often occurs when you do certain activities or feel stressed. It is caused by poor blood flow through the blood vessels of the heart muscle. Keep your blood pressure controlled most often to 130/80. Lower may be better if you have diabetes, kidney disease, stroke, or heart problems, but your provider will give you your specific targets. Take medicines to reduce your cholesterol. Keep your HbA1c and blood sugar at recommended levels. Drinking alcohol. If you drink, limit yourself to no more than 1 drink a day for women, or 2 a day for men. Emotional health. Get checked and treated for depression, if needed. Exercise. Get plenty of aerobic exercise, such as walking, swimming, or bicycling, at least 40 minutes a day, at least 3 to 4 days a week. Smoking. DO NOT smoke or use tobacco. Stress. Avoid or reduce stress as much as you can. Weight. Maintain a healthy weight. Strive for a body mass index (BMI) between 18.5 and 24.9 and a waist smaller than 35 inches (90 centimeters). Good nutrition is important for your heart health. Healthy eating habits will help you control some of your risk factors for heart disease. Eat plenty of fruits, vegetables, and whole grains. Choose lean proteins, such as skinless chicken, fish, and beans. Eat non-fat or low-fat dairy products, such as skim milk and low-fat yogurt. Avoid foods that contain high levels of sodium (salt). Read food labels. Avoid foods that contain saturated fat and partially hydrogenated or hydrogenated fats. These are unhealthy fats that are often found in fried foods, processed foods, and baked goods. Eat fewer foods that contain cheese, cream, or eggs. To reduce the risk of a heart attack, you may also be told to take aspirin, clopidogrel (Plavix), ticagrelor (Brilinta) or prasugrel (Effient) every day. Follow your provider's directions carefully to keep heart disease and angina from getting worse. Always talk to your provider before you stop taking any of your medicines. Stopping these drugs suddenly or changing your dose can make your angina worse or cause a heart attack. Know what can make your angina worse, and try to avoid these things. For example, some people find that cold weather, exercising, eating large meals, or getting upset or stressed worsens their angina. Mozaffarian D. Nutrition and cardiovascular and metabolic diseases. In: Zipes DP, Libby P, Bonow RO, Mann DL, Tomaselli GF, Braunwald E, eds. Braunwald's Heart Disease: A Textbook of Cardiovascular Medicine. 11th ed. Philadelphia, PA: Elsevier; 2018:chap 49. Thompson PD, Ades PA. Exercise-based, comprehensive cardiac rehabilitation. In: Zipes DP, Libby P, Bonow RO, Mann DL, Tomaselli GF, Braunwald E, eds. Braunwald's Heart Disease: A Textbook of Cardiovascular Medicine. 11th ed. Philadelphia, PA: Elsevier; 2019:chap 54. 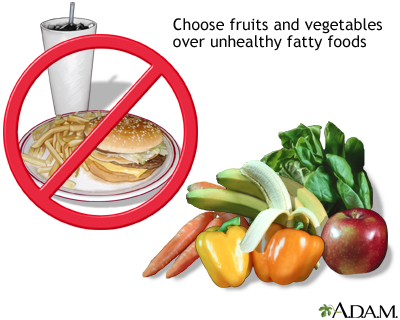 For a healthy diet, replace unhealthy and fattening foods with healthier alternatives, such as fresh fruits and vegetables.